Raymond Vardell McMillan, 68, a retired Air Force Brigadier General who was President of the Computer Technology Associates government technology division in Rockville, Maryland, died April 8, 2002, at his home in Sterling, Virginia. He had cancer. General McMillan joined CTA in 1988, a year after retiring from the Air Force. His final active-duty military assignment was Chief of the System Integration Office and Assistant Deputy Chief of Staff of Systems Integration, Logistics and Support for Air Force Space Command at Peterson Air Force Base, Colorado. He worked for CTA, an information technology solutions firm, in Massachusetts before settling in the Washington area in 1990. He was CTA's chief operating officer and president when he stepped down in 1997 and then returned to the firm in another position in 2000. He spent the late 1990s doing consulting work for the Justice Department. He was a native of Fairmont, North Carolina, and received bachelor's and master's degrees in electrical engineering from the University of Wyoming. He also was a graduate of the Armed Forces Staff College in Norfolk and the Industrial College of the Armed Forces at Fort McNair. He began his Air Force career as a radar maintenance technician. In the mid-1960s, he was at Francis E. Warren Air Force Base, Wyoming, as a Minuteman missile launch officer. In the mid-1970s at Andrews Air Force Base, he was chief of the airborne warning and control system division of Air Force Systems Command and then executive officer for the deputy chief of staff for systems. 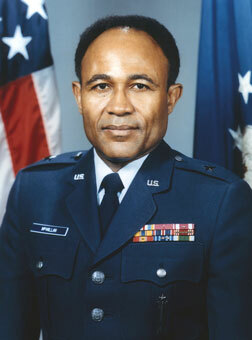 His military decorations included the Defense Superior Service Medal, the Legion of Merit, two Meritorious Service Medals and the Air Force Commendation Medal. His memberships included the Big Brothers association in Maryland. His marriage to Maxine Tyler McMillan ended in divorce. Springs; two brothers; a sister; and nine grandchildren. Force Space Command, headquartered at Peterson Air Force Base, Colorado. General McMillan was born in 1933, in Fairmont, N.C. He earned both bachelor and master of science degrees in electrical engineering from the University of Wyoming in 1970 and 1971, respectively. The general graduated from Squadron Officer School, Maxwell Air Force Base, Alabama, in 1962; Armed Forces Staff College, Norfolk, Virginia, in 1973; and the Industrial College of the Armed Forces, Fort Lesley J. McNair, Washington, D.C., in 1977. He completed the Senior Executive Course at the Massachusetts Institute of Technology in 1983. Force Base and was commissioned a second lieutenant in December 1958. He was then assigned as a student in the Armament Officers Course at Lowry Air Force Base, Colorado, and remained there as a technical instructor in the Avionics Officer Course. During this period he attended Squadron Officer School at Maxwell Air Force Base. In June 1964 the general was assigned to Francis E. Warren Air Force Base, Wyoming, as a Minuteman missile launch officer. After completing this assignment in 1968, he attended the University of Wyoming under the Air Force Institute of Technology Program. He was assigned to Hanscom Air Force Base, Massachusetts, in January 1971, as a radar engineer in the Airborne Warning and Control System Program Office for E-3A's. General McMillan was a radar engineer on the first flight of one of the radar test aircraft and has more than 200 flying hours as a test engineer in the Airborne Warning and Control System Program. General McMillan attended the Armed Forces Staff College from January to July 1973. He was then assigned to Andrews Air Force Base, Maryland, and served as chief of the Airborne Warning and Control System Division, Air Force Systems Command, and later as executive officer for the deputy chief of staff, systems. He then attended the Industrial College of the Armed Forces. Returning to Hanscom Air Force Base in June 1977, the general served as program director of the Seek Igloo Program, the program to replace all surveillance radars in Alaska. While at Hanscom, he also served as program director of the Joint Surveillance System, the replacement program for the Semi-Automatic Ground Environment System, and as Assistant Deputy Chief of Staff for Surveillance and Control Systems. In March 1980 General McMillan was given the task of forming an Air Force Systems Command detachment in Colorado Springs, Colorado. The detachment assists the commander in chief of North American Air Defense and the commander of Space Command in resolving system acquisition problems. When the Space Command System Integration Office was formed in 1981, he became the deputy chief of the organization and served in both positions until May 1983. The general then returned to Andrews Air Force Base as chief of the Program Management Assistance Group, Headquarters Air Force Systems Command. General McMillan returned to Headquarters North American Aerospace Defense Command and Space Command in April 1984 as deputy chief of staff, systems integration, and chief, Systems Integration Office, Space Command. He assumed his final duties in September 1985. Excellence Award, Army Good Conduct Medal with two bronze loops, National Defense Service Medal with service star, Air Force Longevity Service Award Ribbon with seven oak leaf clusters and Small Arms Expert Marksmanship Ribbon. General McMillan also wears the space badge and the senior missile badge. He was promoted to brigadier general September 1, 1984, with same date of rank. On April 8, 2002 of Sterling, Virginia. Beloved husband of Betty McMillan; father of Debra Casey (Charles) and Raymond David McMillan. Also survived by two step-children, Brenda Wash (Curtis) and Douglas Thomas (Connie); nine grandchildren, one sister, Marcenia Easterling; two brothers, Jesse (Geraldine) and Irving McMillan, many other relatives and friends. Friends will be received 6 to 8 p.m., Sunday and 11 a.m. Tuesday, April 16, 2002 at the Oak Grove Baptist Church, 22870 Dominion Ln., Sterling, VA, with funeral service at 12 Noon. Interment 11 a.m., May 8, 2002 with Full Honors at Arlington National Cemetery.